Indeed the most wonderful experience of your life will flying with a balloon in Cappadocia. You can find the opportunitie to see the the region's unique beauty, gliding slowly in the sky. 1 hour 30 minute balloon tour, you will take you to the Cappadocia’s most distant points that not be possible on foot. From 5:00 a.m. to 6:00 in the morning you taken from your hotel and with balloon cars and brought to the field. In field tea, coffee, cakes, assorted ... etc. and breakfast are given to the passengers while the ballons are being prepared.In the meantime passengers will find the opportunity to watch the preparation of the balloon. Balloons, takes off around at 06:00. Approximately at 1000 feet altitude sunrise and general views of Cappadocia are watched. Then going down into the valley views of valley and fairy chimneys are provided for photo shoots. Flight takes approximately 1 hour to 1 hour 30 minutes. A champagne celebration made after landing and flight certificate and balloon hat are presented to passengers as flight memory. Passengers are left with our own vehicles to the hotels again in hours from 8:00 a.m. to 8:30. • Our balloons begin to take off at around sunrise. 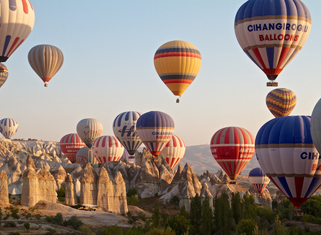 • They rise approximately 1000 feet to show you sunrise and extraordinary views of Cappadocia. • The duration of this tour is approximately 1 hour. • The Standard tour uses a 14-20 person capacity balloons. you excellent views to take pictures or videotape. get cancelled. If you advance paid, your payment will be chargeback. there are no child discounts available. • Hotel Pick-up & drop-off in Cappadocia. • Open buffet breakfast, coffee/tea and snacks before take off. • by Cash (EUR, TL, USD, GBP) or by Credit Card during the Tour.